Roll up, roll up, for the first live action Disney remake of the year. The first of three due to be out in 2019 (with Aladdin and The Lion King to follow) it certainly promises to be a busy year for Disney. Will this remake of the beloved 1941 animated classic be able to live up to glare of the spotlight? As an injured Holt Farrier (Colin Farrell) returns from the war to the life he left behind, he finds it difficult to adjust. His children (Nico Parker, Finley Hobbins) have become self reliant, due to their mother’s death from influenza while he was fighting in Europe, and the circus they are part of is in decline. The birth of an elephant with enormous ears helps to change the fortune of the Medici Brothers Circus (and its ringmaster played with typical grace by Danny Devito), as the young Farriers discover that this baby elephant has the remarkable ability to fly. However the circus’ new found popularity brings it under the gaze of the entrepreneurial V.A. Vandevere (Michael Keaton) who has his own plans for Dumbo. Let’s address the elephant in the room. Even a casual glance at the synopsis, and it’ll become readily apparent that Dumbo is a radical rewrite of the classic version. In shifting the perspective to the humans, rather than allowing talking animals to tell the story, there’s both positive and negative aspects that eventuate. In the positive column it allows this version to tackle many of the issues in Dumbo (1941) and are problematic in this day and age (such as portrayals of race and animal cruelty) and update them to a more modern perspective. However, at the same time it bloats one of Disney’s shortest films out to the two hour mark, and does little in return. The end result is a patchy work, that can hold your wonder and amazement for fragments of its runtime, but on the whole is rather dull and timid in its storytelling. At the end of the day there are many sequences in Dumbo that feel like they’re there purely because they reference something in the original film. An extended musical number, the Pink Elephant’s on Parade is a particularly egregious example, but there are plenty more littered throughout the film. Nor are the original elements particularly compelling in their own right. Bringing two children to the forefront of the script isn’t a bad idea, but neither of the actors have the screen presence to carry the story alone. The more characters (and character arcs) you introduce to shift away from that deficit, the further the tale shifts from Dumbo as a key character. Visually it is typical Burton fare, revelling in the dark wonders of a bygone era, and turning the strange into the desirable. The post war setting and the cusp of a the modern era plays well to his design sensibilities. Similarly the themes of the outsider unlocking their uniqueness to become greater, and to discovering a family of like-minded “freaks” fits with common themes throughout the director’s work. 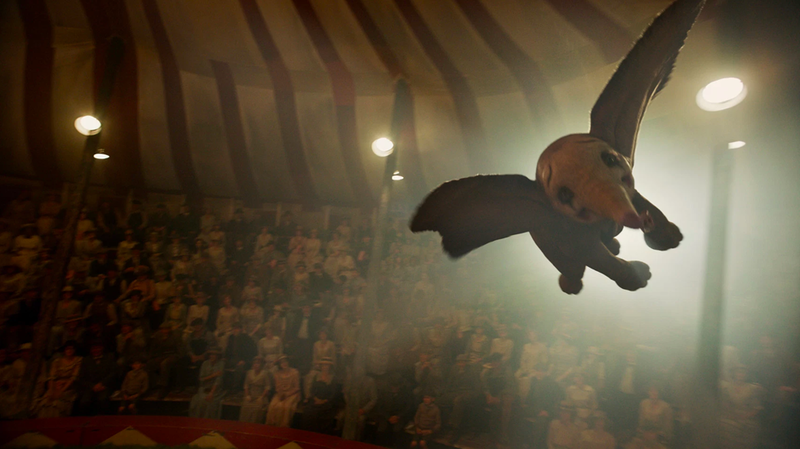 Hence there are times when Dumbo does soar to the heights that the big eared pachyderm deserves to be at, lifting the audience’s spirit and filling them with awe. In those moments, the film shows what it could have truly been, but they are unfortunately far from the whole show.